The Midianites were a biblical people who occupied territory east of the Jordan River and the Dead Sea, and southward through the desert wilderness of the Arabah. They reportedly dominated this territory from roughly the twelfth through the tenth centuries B.C.E. In the biblical account, the Midianites were descended from Midian, a son of Abraham through his concubine Keturah (Genesis 25:1-6). During the time of the Exodus, their territory apparently also included portions of the Sinai Peninsula. The land of Midian was also where Moses spent his 40 years in exile after killing an Egyptian (Exodus 2:11–15). During those years, he married Zipporah, the daughter of Jethro, the priest of Midian. When the Israelites neared Canaan, however, the Midianites came to be seen as enemies after some Midianite women introduced Israelite men to the worship of the local deity Baal-Peor. Moses then led a war of extermination against them. However, in the Book of Judges, the Midianites were strong enough again to cause serious trouble for the Israelites until the judge Gideon subdued the Midianites and their Amalekites allies. Not all of the Midianites, however, were in fact the Israelites' enemies. For example, the Midianite clan known as the Kenites were allied with the Israelites and eventually merged with the Tribe of Judah. The heroine of the Book of Judges, Jael, was the wife of a Midianite who lived among the Israelites. The people of Midian are also mentioned in the Qur'an, where the name appears in Arabic as Madyan. Allah sent to them the prophet Shoaib, traditionally identified with the biblical Jethro. Today, the former territory of Midian is located in western Saudi Arabia, southern Jordan, southern Israel, and the Egyptian Sinai peninsula. 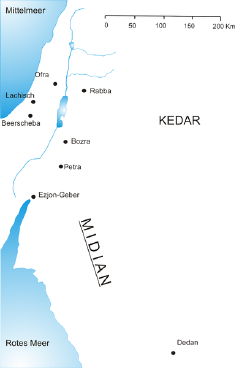 In the Book of Genesis, Midian was the son of Abraham and Keturah. Midian's five sons—Ephah, Epher, Enoch, Abidah, and Eldaah—were the progenitors of the Midianites (Genesis 25:1–4; I Chronicles 1:32–33). Their geographical situation is indicated in Genesis as having been to the east of Canaan, as Abraham sent the sons of his concubines, including Midian, eastward (Genesis 25:6). Midianites figure into the story of the Israelites' migration to Israel when they cooperate with Jacob's sons in selling their half-brother Joseph into slavery (Genesis 37:36). From the statement that Moses led the flocks of Jethro, the priest of Midian, to Mount Horeb (Exodus 3:1), it would appear that the Midianites dwelt in the Sinai peninsula, having either migrated there or conquered or settled the area in addition to their eastern possessions. Later, in the period of the Israelite monarchy, Midian seems to have occupied a tract of land between Edom and Paran, on the way to Egypt (I Kings 11:18). Midian is likewise described as in the vicinity of Moab. The Midianites were beaten by the Edomite king Hadad ben Bedad "in the field of Moab" (Genesis 36:35). In the account of the prophet Balaam it is said that the elders of both Moab and Midian called upon him to curse Israel (Numbers 22:4,7). 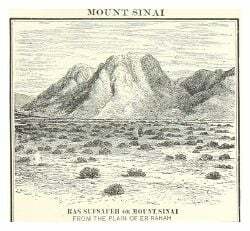 Traditional site of Mount Sinai, described in the Bible as located in Midian. In Exodus, the land of Midian is introduced as the place to which Moses fled when running away from Pharaoh. There, he encountered Jethro, a Midianite priest, who later became Moses' father-in-law. Moses thus lived among the Midianites, and it is during this period that he encountered Yahweh for the first time in the account of the burning bush. His Midianite wife, Zipporah saved his life by wisely circumcising their son when Yahweh attempted to kill Moses on the road back to Egypt (Ex. 4:25). Yahweh was apparently a god known to the Midianites, for Jethro offered a sacrifice to Him and shared the feast with elders of Israel (Ex. 18:12). However, toward the close of the 40 years in the wilderness, the Midianites who lived east of the Jordan felt threatened as the huge force of Israelites moved through their territory, conquering local kings on their way. Thus, they joined with the Moabite king Balak to ask the prophet Balaam to curse the Israelites (Numbers 22). Balaam—who like Jethro honored Yahweh—famously refused this order and blessed the Israelites instead. Subsequently the Israelites coexisted peacefully with Moabites and Midianites (Numbers 25). However, during this time the Israelites intermarried with Midianite women and adopted religious practices deemed unacceptable to Yahweh, namely worshiping the local deity, Baal-Peor. When a plague soon broke out among the Israelites, Moses understood this as a punishment from God. To put an end to the plague, the Israelite priest Phinehas personally killed a Midianite princess named Cozbi, who had married an Israelite man, impaling both her and her husband with a single spear thrust. Moses was ordered by God to treat the Midianites from then on as enemies (Num. 25). One of Moses' last commands from God was to take "vengeance" against the Midianties (Num. 31). He dispatched an army of 12,000 men, under Phinehas. This force utterly defeated the Midianites and reportedly slew all their males, including their five kings—Evi, Rekem, Zur, Hur, and Reba. Also put to death was the prophet Balaam, who had earlier blessed Israel but was now blamed for tempting Israel to sin. Israelite soldiers lead away a Midianite women. 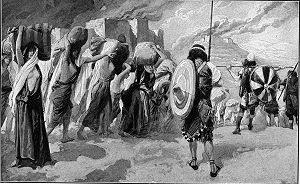 The Israelites captured the Midianite women and children and took all the Midianite herds, flocks and goods as plunder. They burned all the towns where the Midianites had settled, as well as all their camps. They took all the plunder and spoils, including the people and animals, and brought the captives, spoils and plunder to Moses and Eleazar the priest and the Israelite assembly at their camp on the plains of Moab, by the Jordan across from Jericho (Num. 31:9-12). This, however was deemed not to be a thorough enough slaughter. Moses asked, "Have you allowed all the women to live?" He then ordered that all the older women be put to death, together with all of the boys, leaving only the virgin girls alive to become wives of the Israelite soldiers. The narrative indicates that each of the five Midianite tribes was governed by its own king, but that all acted together against a common enemy. Some of the Midianites seem to have lived in the fortified towns in the vicinity of Moab while others lived a nomadic life. The account of Moses' war of extermination against the Midianites, however, appears to be exaggerated, for the Midiantes reappear as a major power several generations later in the time of Gideon. Israelites keep watch for the Midianites who have forced them into hiding. 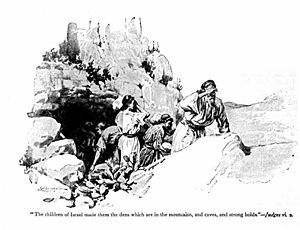 The biblical account of Gideon (Judges 6-8) indicates that the Midianites were so powerful in the region of the Tribe of Manasseh that the Israelites there were forced to abandon their fields and take shelter in mountain clefts, caves, and strongholds. Together with the Edomite tribe of the Amalekites, they harassed the Israelites as far to the west as the Philistine city of Gaza. The Israelites reportedly suffered at the hands of the Midianites for a time period of six years. Midianite raiders destroyed crops and reduced them to extreme poverty (Judges 6:1–6). Indeed, aside from allusions to this victory—in Psalms 83, Isaiah 9:4 and 10:6, and Habbakuk 3:7—Midian is not mentioned again in the Hebrew Bible. The apocryphal Book of Judith (2:26) uses the term "Midianites" as a synonym for "Arabians." 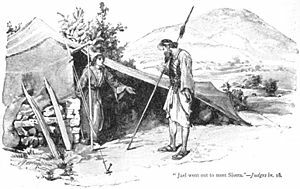 The heroine Jael lures Israel's enemy, Sisera, into her tent. The descendants of Moses' father-in-law, the Kenite, went up from the City of Palms (Jericho) with the men of Judah to live among the people of the Desert of Judah in the Negev near Arad. Later, the wife of a man named Heber the Kenite played a major role in the Israelite victory commemorated in the "Song of Deborah." Heber's wife Jael lured the Canaanite commander Sisera into her tent and assassinated him in his sleep. The Bible preserves a lengthy poem describing the event, which declares: "Most blessed of women be Jael, the wife of Heber the Kenite, most blessed of tent-dwelling women" (Judges 5:24). Later, when King Saul is commanded by God to destroy the Amalekites, among whom some of the Kenites dwell, the Kenites are spared by being given a warning to move away from the Amalekites before the slaughter begins (1 Samuel 15:6). Midianites are thought to have been involved together with the Egyptians in mining endeavors at Timna, 30 km north of the Gulf of Eilat, indicating a relatively sophisticated cultural and technological level. The Midianites have been tentatively connected by some scholars with the remnants of the Hyksos who once ruled Egypt but were later driven out and made their home in the desert. They have also been identified with the people whom the Egyptians called the Shasu. An Egyptian inscription refers to "Yhw in the land of the Shasu," a people living in what the Bible describes as Midianite territory. This has led to speculation that the Shashu/Midianites may have been early worshipers of Yahweh, the "God of Abraham." Some consider them as "proto-Israelites," a term referring to various peoples in an around the land of Canaan who later evolved into or merged with the people of "Israel" (Finkelstein 2002). The biblical account describes the Midianites as worshiping more than one deity, including both Baal-peor and Yahweh. Both of these deities are likewise described as being worshiped by the Israelites themselves, although Baal worship was supposedly forbidden to them. Some scholars speculate that the worship of Yahweh may have actually begun among the Midianites and was later adapted by the Israelites, an idea strongly contested by Christian scholars. Supporting this theory is the fact that Exodus states that God was known as as El-Shaddai by the Israelites until Moses' encounter with Him at Sinai, after first meeting the Midianite priest Jethro and marrying into his family (Exodus 6:3). Archaeology in Israel: Timna Jewish Virtual Library. This page was last modified on 8 March 2019, at 21:26.